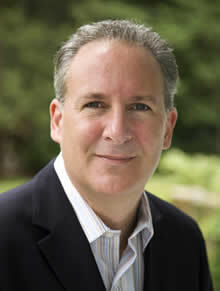 Peter Schiff is an Investment broker , Author and recently ran for US senate in 2010. He is one of the few in the financial community who sees things as they actually are and is not afraid of ridicule in predicting the obvious outcome of this ponzi scheme otherwise known as the US economy. In Fact Peter Schiff predicted the demise of Fannie Mae and Freddie Mac and has been vocal in unveiling the absolute insanity of our Politicians and their handling of the so called economic crisis. Like many sane humans still left on the planet , Peter believes that corporations should be allowed to fail , the economy should be allowed to go into a recession. As painful as that might be it’s better than propping it up so that when it does collapse it could be catastrophic. Peter Schiff like Ron Paul is vocal about the Federal Reserve and it’s abuse of power and believes it is at the heart of the problem with it’s close ties to Wall Street and control over Politicians. Of course many of us now know the story behind the Federal Reserve, a private banking oligarchy/cartel that is no more Federal than Federal Express. In a world of Crony,Rigged Market,Cut Throat Capitalism where the rules do not apply to the “Too Big To Fail” Peter Schiff is a voice of reason , making a stand, trying to educate the sheeple on all things economic. Check out the books below by Peter Schiff ! Here is Peter on the Schiff Report recently where he breaks down the recent decline in commodities like Gold , Oil and Silver. Like most of us he sees these declines as short term volatility in a Bull Market. After all with the endless printing of trillions the devaluation of the US dollar is almost assured , like they are planning it ! This video is a set of clips where Peter made various predictions that all came true , showing that his grasp of the situation is born from looking at current events and forming future trends. While this sounds logical , most of what you hear in main stream financial reporting is nothing more than government sound bites meant to distract and give a false sense of security.